I am so praying for Spring. Yesterday, a seven year old boy told me that spring comes on March 20th and I didn't believe him so he pulled out a calendar to show me. It must have been printed in the USA since we all know that spring is at least six weeks away. Still, one can hope. Everything is fast melting and this past weekend, it was warm. or so I think it was since I was in Calgary, where it was even warmer. 12oC during the day. I had originally made it for a monthly swap club I am in. But I had since found out I was a little late so I decided to opt out for this month. The challenge was to use punches on your card. 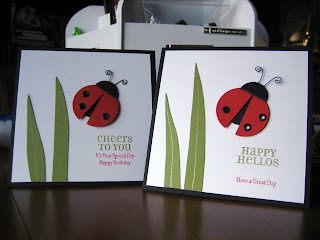 I used two circle punches to make the lady bug. The spots were done using black eyelets and the feelers were done with black craft wire. My favourite part of this was the Sakura stardust pen "clear" which I used to draw the glitter line on the blades of grass. I just want to run out to Deserres to buy myself more pens so I never run out. It adds glitter to anything in such a precise way since it is in a pen. Posted by Diane aka cameldiva at 10:47 p.m.